This ten-week course introduces Christ as he walks off the pages of Mark's Gospel, revealing the true nature of God's grace. Participants can ask any question they like as together they explore who Jesus is, why he came, and what it means to follow him. Revised 2003. - Publisher Rico Tice is an associate minister at All Souls Church in London. He studied History at Bristol University and attended theological college at Wycliffe Hall, Oxford. - Publisher Offers practical guidance on preparing for and promoting your Christianity Explored course. Also included are transcripts of the talks for course leaders who want to deliver the 'talks'. 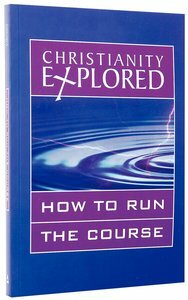 About "Christianity Explored: How to Run the Course (2003)"
Rico Tice is an associate minister at All Souls Church in London. He studied History at Bristol University and attended theological college at Wycliffe Hall, Oxford. Offers practical guidance on preparing for and promoting your Christianity Explored course. Also included are transcripts of the talks for course leaders who want to deliver the 'talks'.